1888: A killer stalks the streets of London's Whitechapel district, brutally--some would say ritualistically--murdering women. With each slaying, the killer grows bolder, his crimes more extreme. So far, there have been five victims (that we know of): Mary Ann Nichols, Annie Chapman, Elizabeth Stride, Catherine Eddowes, and Mary Jane Kelly. The story of Jack the Ripper captured lurid headlines and the public's imagination, and the first fictionalization of the Ripper killings, John Francis Brewer's The Curse Upon Mitre Square appeared in October of 1888, mere weeks after the discovery of Jack's first victim. Since then, hundreds of stories have been written about Bloody Jack, his victims, and his legacy. 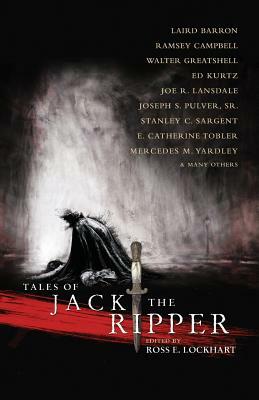 Authors ranging from Marie Belloc Lowndes to Robert Bloch; from Harlan Ellison to Maureen Johnson; from Roger Zelazny to Alan Moore have added their own tales to the Ripper myth. Now, as we arrive at the quasquicentennial of the murders, we bring you a few tales more. From the editor who brought you The Book of Cthulhu comes Tales of Jack the Ripper, featuring new fiction by many of today's darkest dreamers, including Laird Barron, Walter Greatshell, Silvia Moreno-Garcia, Ed Kurtz, Joseph S. Pulver Sr., Stanley C. Sargent, E. Catherine Tobler, and many more.